First impressions take six times to change. If you get it wrong the first time you have to get it right the next five times just to start over. 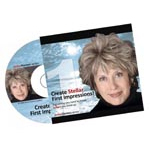 Fran created this CD to ensure that every first impression you make is a stellar one that opens doors for you. The first of a new stellarStarters series, this CD tells you what you need to do before you show up – from the accessories you wear – to the language you use. Start creating stellar memories of you – now! !